Quoting software can increase your sales team’s productivity, impress your clients, and ultimately help you win new business. So what is the key to winning that new business? Besides various factors such as pricing, product and service quality, marketing and branding, etc. – it is the sales process that plays the major part in sustaining business growth. All the way from the first ‘hello’ and building relationships, to the initial business offer, following up and closing the deal. The entire sales cycle requires excellent and swift communication with a personalised approach. Quoting software streamlines and automates the proposal and request for proposal process for sales operations. Today, common integrations include CRM, e-signature, accounting, e-commerce software, etc. – all this makes the entire sales process much more efficient. The benefits of quoting software include the ability to quickly generate professional and impressive business proposals and sales quotes. The kind that are designed with winning business in mind. Quotes and proposals can be generated in multiple file formats and easily shared through multiple channels. The formats include dedicated proposal landing pages, which get approved approximately 18% more likely than traditional proposals. Essentially, quoting software allows you to spend more time on your clients, and less time on paperwork and proposals. And that approach will definitely win you more business. Here are sixteen quoting software that will help you on the way. Scoro is a faster, easier, and better way for quoting and billing for your products & services. Instead of using five different tools to send quotes, manage contacts, and handle billing, you can just use one powerful quoting software. 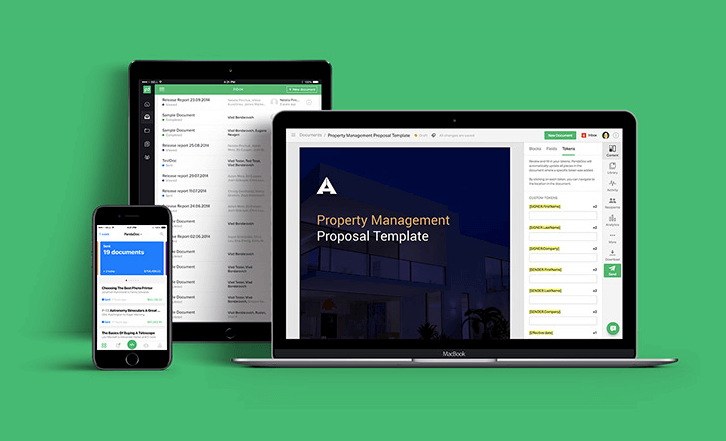 Impressive proposals and quotes can be created in just a few clicks. What’s interesting about this tool: Get a complete overview of a client or supplier on one page – from the first “hello” to the final invoice. This includes contact details, linked files, communication history, linked projects plus all quotes, orders and invoices. In fact, Scoro gives you the tools to manage every aspect of your business – projects, clients, quotes and invoicing. Instead of switching between spreadsheets and emails, you’ll save countless hours by managing everything within a single solution. With Qwilr, you can replace your PDF proposals, quotes and presentations with interactive & mobile-friendly web pages. The pages plug into your systems and are as easy to build and reuse as they are beautiful. What’s interesting about this tool: You can track and analyse how your sales and marketing material is browsed. Be notified when your document is first viewed, see how many times it was viewed & what sections your clients actually cared about. Pricing: Free and paid plans from $39/month. Free trial for 30 days. 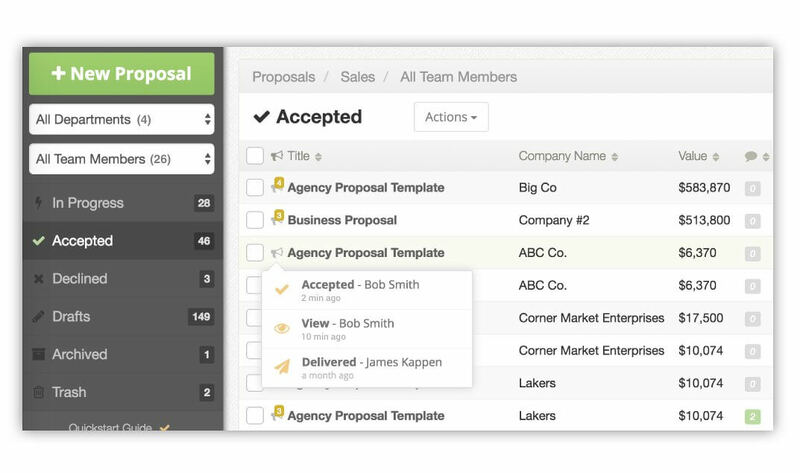 Proposify is quoting software that’s made for sales professionals, agencies and service businesses. It creates beautiful, customised proposals and allows you to get faster sign-off from clients. Proposals are streamlined in the cloud. What’s interesting about this tool: Clients can view your proposal anytime and anywhere, plus online signatures deliver a 60% faster sign-off. Find out as soon as your client opens the proposal, what interests them the most, and when they sign off. Pricing: Plans from $25/month per user, and from $50/month for an unlimited number of users. DocSend is a content management and tracking solution that helps sales and marketing teams be more efficient. With DocSend, you can see when, where, and how people engage with your sales documents. That allows you to keep the conversation going, from the initial pitch to closing the deal. What’s interesting about this tool: Instant notifications alert you when a prospect engages with your content so you can provide timely and relevant outreach. 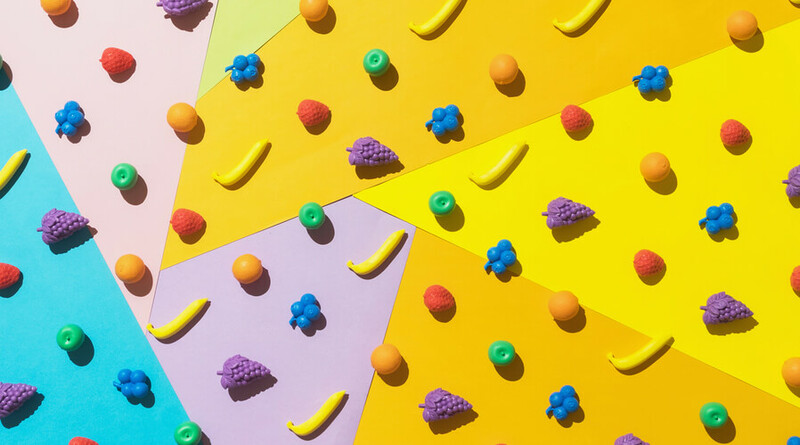 You can find out what matters most to your prospects with page-by-page analytics of your presentations and other content. Pricing: From $10/month per user. Free trial for 14 days. PandaDoc is a document automation tool that delivers higher close rates and shorter sales cycles. Custom-made proposals can be made in minutes. What’s interesting about this tool: PandaDoc’s document analytics make it easier than ever to track the progress of every quote. 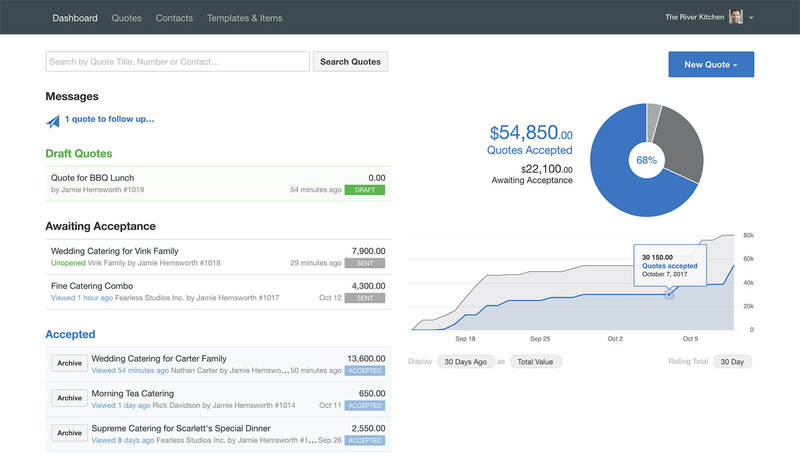 Once you’ve sent a quote to a client, document analytics show you when a customer opens, views, and signs. Pricing: From $19/month per user. Free trial. 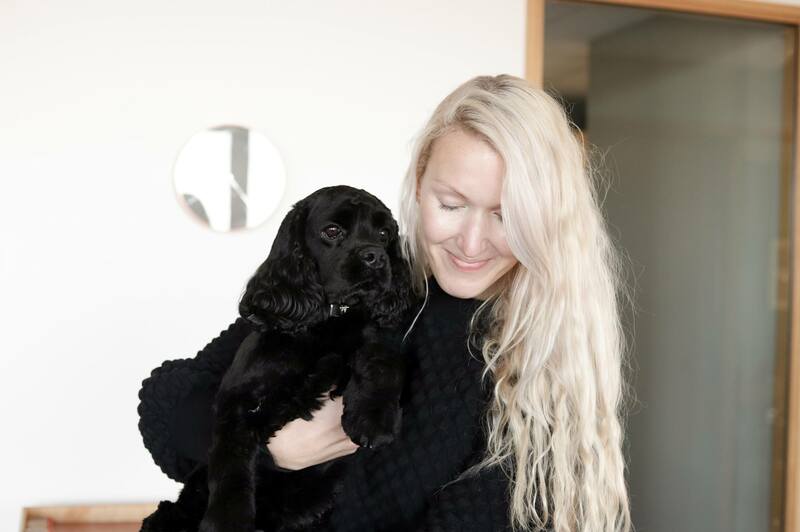 Nusii is an online quoting software created for creative businesses. It’s got the right features to help you get beautiful proposals out the door fast. What’s interesting about this tool: Once you and your team are happy with your proposal, hit send and Nusii will keep track of it, 24/7. The moment your client opens it, you will be sent a notification, making sure you’re always in the loop. Pricing: From $29/month per user. Free trial for 15 days. 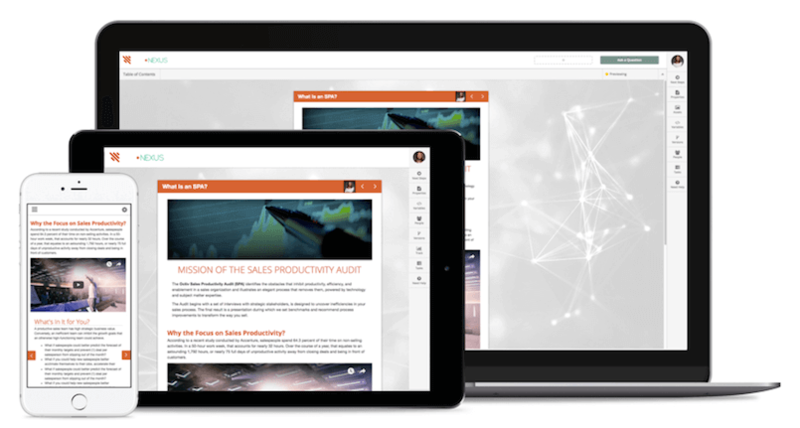 Loopio is a proposal and knowledge management software tool that empowers sales, marketing, proposal teams, and subject matter experts to manage company knowledge and collaborate on client requests. What’s interesting about this tool: You can build a ‘request for proposal’ response library, tag and categorise content, and then Loopio’s automation engine pulls from your library to auto-populate a proposal. Bidsketch quoting software used by freelancers, consultants and agencies. Bidsketch allows you to create, electronically sign, and track professional looking client proposals. What’s interesting about this tool: Bidsketch allows you to create customised client landing pages. The client can then view, approve, export, and comment on their proposal quickly to help users stand out as a professional and make interaction with clients more convenient and organised. Another interesting feature is optional upselling. You can grow your revenue by marking specific fees as optional and giving clients the option to accept them when viewing a proposal. Pricing: From $29/month per user. Free trial for 14 days. Osmosis is a quoting software solution for small businesses, but also it provides you with tools to create customisable online client questionnaires, e.g. for gathering project requirements. What’s interesting about this tool: Quotes and proposals are presented as customised web page that can be exported as a PDF. Pricing: From $19/month. Free trial for 14 days. 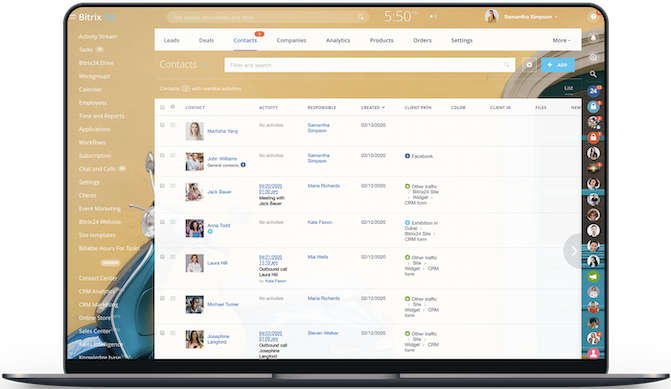 Octiv is a cloud-based sales productivity suite that provides a more effective way to build and deliver sales proposals, contracts, and presentations directly from CRM. What’s interesting about this tool: View next-generation documents on a desktop, iPad, or mobile device. The document design will scale appropriately regardless of whichever device is used. Quotient is an online quoting and proposal software that serves a general purpose. Therefore it appeals to a wide range of businesses which are involved in direct sales. What’s interesting about this tool: Features such as auto-completion, image and file attachments and template saving make the quote creation process more efficient. Quotes will be archived in the system and can be searched using keywords. Pricing: From $20/month per user. Free trial for 30 days. Mosspaper is a mobile-friendly quote and contract management system that offers small businesses a platform from which to create, sign, track and accept quotes and contracts. With paperless approvals, electronic signature capture, and payment integration, Mosspaper aims to deliver a simple quote and contract management solution. What’s interesting about this tool: Besides quote and contract creation, Mosspaper allows users to track and manage contract payments. From Mosspaper’s centralised platform, users can send payment requests to customers, review outstanding balances, and collect payments. Through integration with Stripe, users can directly accept secure international payments. Mosspaper also enables users to gain business insight through predictive data analytics and an activity dashboard. Pricing: Free and paid plans from $19/month. Free trial for 30 days. 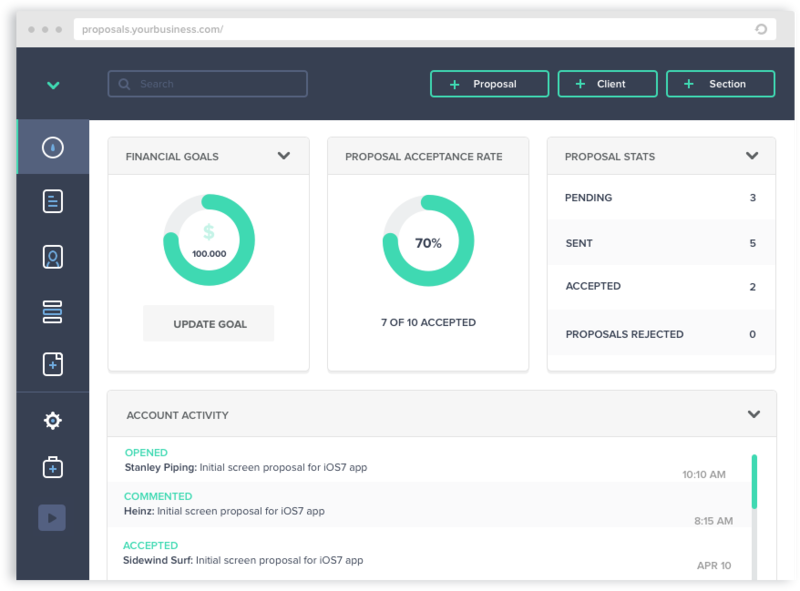 Proposable is an all-in-one cloud proposal software for smart & efficient sales proposal creation, delivery, and closing. What’s interesting about this tool: Proposable has drag-and-drop creation tools, email and SMS notifications for when documents are viewed, and analytics for getting a better understanding of your sales pipeline. It also includes an estimate framework to make this part of the process less painful. Pricing: From $39/month per user. Free trial for 14 days. Odoo encompasses sales and project management in a single tool. Polished quotes can be created in minutes. Predefined products, price lists, and templates help your sales team work more efficiently. What’s interesting about this tool: Odoo is available in 23 languages and serves almost all geographies around the world. Pricing: Free and paid plans from $14/month. In addition to quoting capabilities, Bitrix24 offers tools such as a CRM and project management. Bitrix24 quotes and invoices are fully customisable and come with powerful tools, like multiple currency support, taxes, automatic numbering, product catalogue and email marketing. What’s interesting about this tool: Bitrix24 can be used as an online service (Cloud version, SaaS) and as a ‘box’ product (Self-hosted version, i.e. installed on your own server). Depending on your business nature, company size, and requirements for an intranet solution, you can choose between the flexible Cloud subscription plans, or develop a custom intranet project using the Self-hosted version. Pricing: Free and paid plans from $39/month. Socket simplifies your sales quoting process by bringing all of your product and quotation information into a single place that’s easy to manage. What’s interesting about this tool: Socket utilises a world-class data centre to ensure our software is always blazing fast, reliable, and secure. Pricing: From $49/month. Free trial for 7 days. The choice of software really depends on your business nature, company’s size, type of clients and staff, workflow and sales processes. Keep testing new solutions until you find the most suitable one!